Initially, Dazibao was devoted exclusively to photography and shared the view that the image was defined by its documentary potential—as a way of understanding the world and, by extension, of acting upon it. This approach was quickly run through with a host of theoretical questions around the mechanisms for producing images and their uses. Artworks produced in this context, motivated more by the modus operandi of the image and its new video and digital forms, sometimes became almost completely devoid of any wish to engage in representation. Far from the belief in a kind of failure of the image, and freed from this discourse around its status and nature, some artists are concerned mostly with what images can convey... or not. In a world obsessed with its representation, these works establish reception conditions and times that differ from media images and are driven by a desire to show in a new light events or stories which are normally glossed over or habitually removed from public scrutiny. Ali El-Darsa, Gabriela Golder, Roberto Santaguida and Sandra Volny offer a few singular approaches to what could be a new wave in documentary. A form of documentary which would often work through accumulation, seeking a kind of truth by multiplying points of view and bringing together several ideas. F.C. Ali El-Darsa, born in Beirut, Lebanon, works and lives between Berlin, Montréal and Toronto. He holds a Master of Visual Studies from John H. Daniels Faculty of Architecture, Landscape and Design at the University of Toronto and a Bachelor of Fine Arts in Intermedia/Cyberarts from Concordia University, Montréal. His work in video, performance, sound and installation has been extensively presented across Canada and internationally. El-Darsa’s work deals with issues of identity, concepts of the self and personal histories—examined within the margins of public and private structures. Language plays an important part in his work as a medium of examination, mediation and reflection and often questions specificity of media and their crucial part in creating networked, mediated memories and narratives. In The Color Remains the Same, Ali El-Darsa puts reality at a distance by using the video camera of a mobile phone as a witness, albeit a not very reliable one, to a portion of his experience in Beirut. The chaotic editing of the video’s sound and image is fully in keeping with the tone of what they are recording, casting the city’s confusion into relief. Shots from a balcony show the full euphoric ferment brought on by Germany’s victory in a FIFA final, punctuated by the crackling of fireworks. Then, over screen shots of a live television bulletin on an explosion in a public space, a couple ironically discusses the likelihood of their going out in such circumstances. Images of diplomas being granted, with a soundtrack of a patriotic song about Lebanon as a land of freedom, precede other particularly “jumpy” images from an unintentional recording of the explosion we have just seen on the news bulletin. Although the work lacks any formalist objective, it nevertheless achieves a form which matches the surrounding tumult in every respect and, perhaps especially, stands for the difficulty individuals have in finding their role in it. Just as much as the visuals, the sound in this video (and especially the spoken word) maintains a degree of confusion which makes numerous interpretations possible. In this organised disorder, Ali El-Darsa intriguingly questions the links between individual perception and collective memory at a time when a large part of our “reality” is filtered through the media. The Document Remains the Same is almost an echo of The Color Remains the Same. Once again, the artist has used that popular, truly low-tech device, the cellular phone, to create the work. This time, however, it is not turned on his subject, but is instead an extension of the protagonist’s body, thereby producing quite broken up and jumpy images. The Document Remains the Same derives from a suicide bombing by a member of Islamic State in a Beirut hotel as the Lebanese security forces moved to arrest him. The bombing was premature, as the suicide bomber intended to blow himself up in Beirut’s southern suburbs during Ramadan. No image of this subject or of these places is shown to us, because the video is made up of a single long take showing the ground being tread by two people feverishly criss-crossing the city. A conversation lets slip a few details in a broken and sometimes terse exchange about getting to the site of the explosion as quickly as possible. 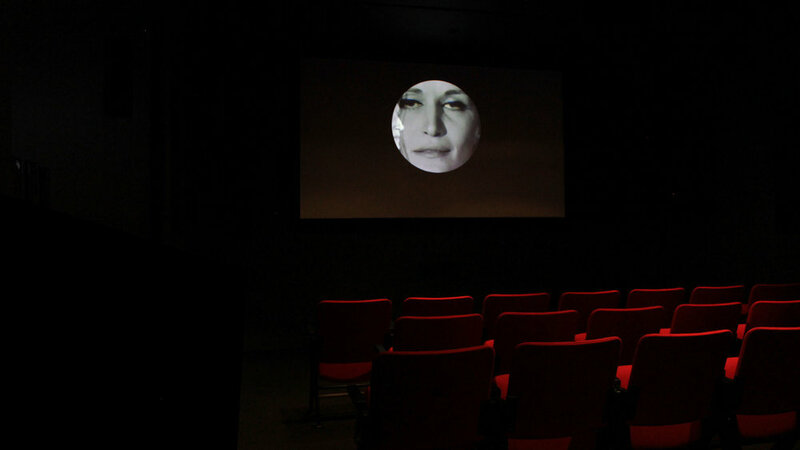 Projected a screen divided in two, the work first shows, on the left, a version of the video without subtitles, and then on the right a subtitled version. And yet the document is the same, in each case lacking in precise indications, modulated more by the soundtrack, its rhythms and tensions, and our sense of being one with the protagonist as he tries to resituate himself in a city he is rediscovering fourteen years later.